For months, rumors have been swirling that Apple was planning on rolling out some big changes to Siri, its chirpy digital assistant. Onstage at WWDC today, the company finally unveiled those updates, and—surprise, surprise—they’re mostly in line with the earlier whispers. Apple announced two major updates at its annual developer conference. First, Siri will finally be available for your Mac, which means it can now help you get your work done, browse Reddit, or do whatever else you like to do on your desktop. 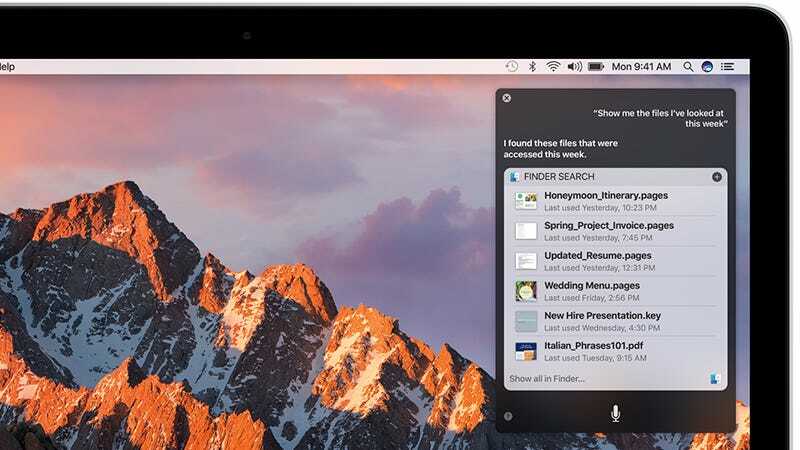 Siri’s desktop frontier comes as part of macOS Sierra—a brand new name, natch—the full release of which will come this fall. “It’s the same Siri that we know and love, but now on the Mac, it can do so much more,” Craig Federighi told the audience. During the demo, Siri for Mac hung out in the upper right hand corner, and functioned pretty much as you might expect. It can search the web, message friends, and help you with your presentations. Second, Apple is opening up Siri to developers, which will let third-party developers integrate their apps with Siri’s voice-controlled functions, so you’ll be able to ask the personal assistant to order you an Uber, check your bank balance, and more. You’ll be able to go into Siri and say things like, “Siri, find me a restaurant,” or “Siri, please find me some Ben & Jerry’s, because I’m sad right now.” (Okay, maybe not.) Eddy Cue demonstrated one integration early on, when he went through the tvOS demonstration: He asked Siri to search for Steph Curry videos on YouTube. Other apps named onstage during the actual integration demo were Slack and WhatsApp. Though Apple has agreements with a smattering of apps, like Yelp, widespread access to third-party app integration is long overdue. As many pointed out when the SDK rumors first popped up, introducing third-party capabilities is a vital step for Apple: Its major competitors, like Amazon’s Alexa assistant, already have third-party integration. And with the recent introduction of Google Assistant and Google Home, the virtual assistant field is becoming a lot more cutthroat. Allowing Siri to work with third-party apps—and with desktops—is an attempt to rise to the top of the pile.